DONETSK, Ukraine -- A gigantic explosion shattered the stillness of an early fall morning here just hours after Ukraine and pro-Russian rebels signed the latest version of their cease-fire accord, illustrating the fragility of the truce agreed upon two weeks ago. Although shelling and other violence continues daily, both sides maintain that the agreement is still in force. The amendment signed overnight Friday into Saturday was meant to strengthen the truce, requiring both sides to move their artillery pieces nine miles back from the front lines, forming a buffer zone clear of heavy weapons. Although the artillery fire on Saturday violated the initial cease-fire, it was not a direct breach of the new provision because of a 24-grace period for its implementation. The artillery struck a dynamite factory that had served this region’s mining industry, with predictably dramatic results. Two powerful explosions lifted a towering cloud of white smoke over the site that was visible from miles away. “What sort of cease-fire is this if every day they shoot at us?” said one rebel soldier at a checkpoint near the factory, who gave only his first name, Sergei. European nations have said they will repeal sanctions imposed on the banking and oil industries in Russia if the cease-fire holds. Ukraine and Western governments have accused Russia of sending soldiers and weapons to back the insurgency in eastern Ukraine. Russia denies that but says Russians have volunteered as private citizens to fight there. Under the new agreement, neither side is to try to advance beyond positions held as of Friday. In fighting over the past 24 hours, separatists tried to advance into the villages of Novoselovka and Putboyoviky after initially shelling those locations, but they were repulsed, a Ukrainian military spokesman said. In the combat in the east over the same period, one Ukrainian soldier died and seven were wounded. From the rebel-controlled areas, evidence of truce violations were also evident. 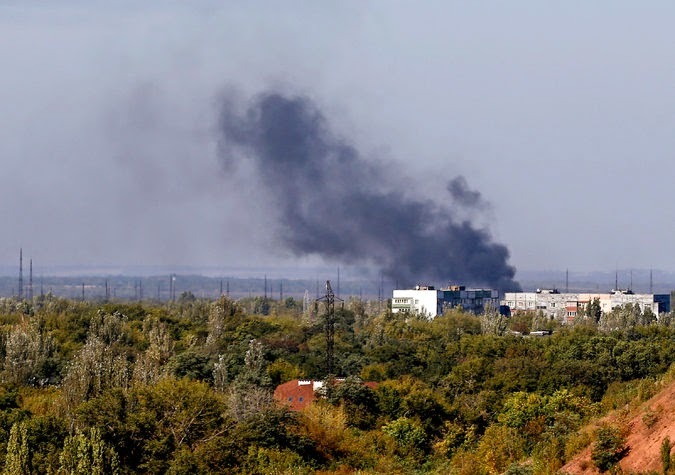 The Donetsk mayor’s office reported that artillery shells or rockets had struck four residential buildings in the city Friday into Saturday, though nobody was harmed. It was unclear which side had targeted the factory, or whether it had been hit inadvertently. Through the afternoon, sporadic explosions rang out near the site. Some residents said that in addition to affecting the TNT production line, a fire had spread to a warehouse used as an ammunition depot. From a vantage point on a dirt road at the edge of a cornfield overlooking the burning dynamite factory about two miles away, regular blasts from artillery could also be heard amid the explosions. Smoke rose from the area of the Donetsk airport, which is held by the Ukrainian Army and is the site of near-daily artillery duels in spite of the cease-fire. Tank or artillery shells were being fired toward the airport from rebel-held areas in the city. Also emblematic of the fragility of the cease-fire, a provision requiring an exchange of all prisoners has broken down, with each side trading detainees on a piecemeal basis. Behind separatist lines, Ukrainian prisoners of war, haggard and filthy, are openly being put to work clearing debris from war-damaged buildings. In the town of Snezhnoye, one group cleared debris from a destroyed building beside a main road. Pvt. Vladislav Marinenko, who turned 20 on Thursday, said he had been captured by Russian paratroopers in the village of Zerkalnoye in late August and later handed over to local pro-Russia militiamen. His unit’s tanks had been destroyed and surrounded, he said. A Russian officer crossed the lines carrying a white flag and offered the Ukrainians the option of surrendering. Some Ukrainian soldiers tried to escape on foot through the cornfields, while others surrendered, Mr. Marinenko said. Asked why he had not yet been traded, he said: “How should I know? I’m just a little guy in all of this,” as he chucked another brick off the pile of debris. During the lull of the cease-fire, the separatist army has regrouped as the Army of Novorossiya, or the Army of New Russia, uniting the forces of the previously distinct rebel states of Luhansk and Donetsk and a multitude of pro-Russian militias such as the Vostok Battalion, the Russian Orthodox Army and the Army of the Southeast. The new name bears within it a threat. The land of New Russia extends well beyond the boundaries of the Donetsk and Luhansk regions to all territory conquered by Catherine the Great in the 18th century, now eight eastern and southern provinces in Ukraine. “If they violate the cease-fire, we will keep going” beyond the Donetsk region, a rebel commander who goes by the nickname Dushman said in an interview. On Saturday, a third convoy of white-painted Russian military trucks arrived in Donetsk carrying what the Russian government said was humanitarian aid such as sacks of flour, electrical generators and warm winter clothing. The Russians said the aid would alleviate difficulties the population faces, while Ukraine said shipments that crossed border posts controlled by separatists violated its sovereignty. The trucks drove in a convoy on the roads in eastern Ukraine with Russian flags attached to their rearview mirrors.